Richie McCaw's standing within the All Blacks team is unmatched. The captain of Graham Henry's team since 2006, McCaw has carved a niche for himself as the modern-day great within the All Blacks - the charismatic, never-say-die leader whom fans of the Men in Black have come to hold in the same light as many of the most revered captains of yesteryear. Richie McCaw: A Tribute to a Modern-day Rugby Great charts the career of the proud Canterbury and Crusaders star who first burst into the national rugby conscience in 2001 when he helped his province to an NPC championship. Soon after, he was making his All Blacks debut in Dublin, beginning a test career that will ultimately culminate at the 2011 World Cup in New Zealand. Author John Matheson tells the story of how the understated McCaw has reinvented himself to emerge as the talisman for his charges in the same way that Buck Shelford, Sean Fitzpatrick and Tana Umaga have done before him. Interviews with teammates, coaches and opponents will help the reader gain a renewed respect for McCaw, as the All Blacks plan their next assault on the Rugby World Cup. 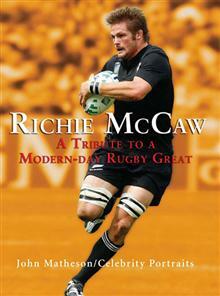 Richie McCaw: A Tribute to a Modern-day Rugby Great takes the reader inside McCaw's inner circle to tell his story of Tri-Nations, Bledisloe Cup and Grand Slam success, overcoming shattering injuries and concussions, and World Cup heartbreaks in Sydney and Cardiff. Tellingly, though, McCaw - who was at the All Blacks helm for the Cardiff calamity - never lost the respect of the public following the 2007 World Cup. Indeed, the way he handled the aftermath only strengthened his standing with the All Blacks nation. Richie McCaw: A Tribute to a Modern-day Rugby Great plots his post-World Cup rehabilitation and celebrates the fact that, as the 2011 event nears, the All Blacks - on-field at least - are in the best possible hands as they set about replicating the efforts of David Kirk's 1987 All Blacks. John Matheson has penned 15 books, including bestsellers on Christian Cullen, Tana Umaga and Buck Shelford. He has worked for the Auckland Star and Sunday Star and was the former editor of the Qantas-award-winning Sunday News, and is the longest-serving editor of NZ Rugby World.